A Letter On Finding A Husband Before Graduation Spurs Debate A Princeton University alumna advised young women studying at her alma mater to find husbands now and not wait. Susan Patton's letter set off a heated discussion, but she stands by her words. 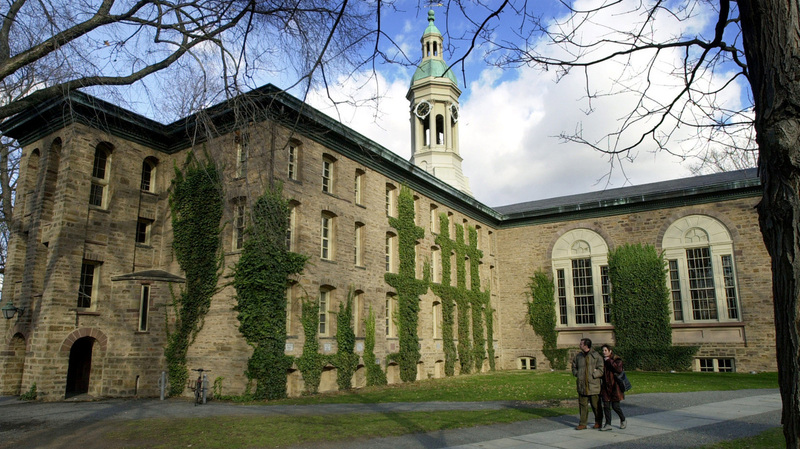 A couple walks past Nassau Hall on the Princeton Unversity campus in Princeton, N.J. A letter to the editor in The Daily Princetonian urging female students to find a husband before they graduate has drawn criticism. More than a week after Susan Patton's letter to the editor of The Daily Princetonian prompted heated criticism, the 1977 Princeton alumna says she still stands by her words. "I have never had a problem voicing an unpopular opinion if it's heartfelt," Patton tells NPR. In her letter, Patton wrote to young women attending her alma mater, "Find a husband on campus before you graduate." Patton is the divorced mother of two sons — both "Princetonians." She says the older already "had the good judgment and great fortune to marry a classmate." She says her younger son is a junior with a limitless universe of women he can marry. "Men regularly marry women who are younger, less intelligent, less educated," writes Patton. But, she argues, Princeton women should marry a man who is their intellectual equal. "Simply put, there is a very limited population of men who are as smart or smarter than we are," she writes. She goes on to argue that the supply of such men dwindles as Princeton women get older. Patton advises young women to look for a husband now because "you will never again have this concentration of men who are worthy of you." The letter has sparked conversation and criticism on campus and across the country. "I kind of really think that it was an article that didn't need to be written," says Pallavi Koppol, a freshman who intends to major in computer science. Koppol says Patton's language seems out of place in today's world; others on campus agree. I could not be more sincere in my belief that this is sound advice. But, as is the nature with any advice, take it or don't take it. "I don't think that she has framed this debate in a particularly helpful manner," says Liz Ramey, a second-year master's student at the university's Woodrow Wilson School of Public and International Affairs. Ramey says Patton raises important issues, though, such as balancing personal and professional lives. But she says those discussions already were taking place on campus. Now, because of Patton's controversial letter, the conversation is happening across the country. Nina Bahadur, who graduated from Princeton last June, wrote a column in response to Patton's advice for The Huffington Post, where she is an assistant editor. "Girls who are still in school don't want to be defined by the person that they might end up marrying," Bahadur says. And she argues that most college graduates just aren't prepared for marriage. "They aren't ready to be looked at as a unit made up of two people because they're still figuring out who they themselves are," she says. Heather Havrilesky, a 42-year-old columnist, wrote the memoir Disaster Preparedness, which includes her search for love during her 20s. She received advice similar to Patton's and took it to heart in her dating life. "Every single guy, I wanted to marry," Havrilesky says, "and, thankfully, none of them wanted to marry me, because I'd be married to the wrong person right now." Havrilesky waited until her mid-30s to marry. She suspects Patton's heart is in the right place but says waiting was a better option for her. Instead of focusing on the criticism, Patton prefers to talk about the letters she says she has received in the past week from mothers who tell her, "This is just what I wanted to tell my own daughters." "I could not be more sincere in my belief that this is sound advice," Patton says. "But, as is the nature with any advice, take it or don't take it." In any case, Patton says, she's pleased her letter is prompting widespread discussion.